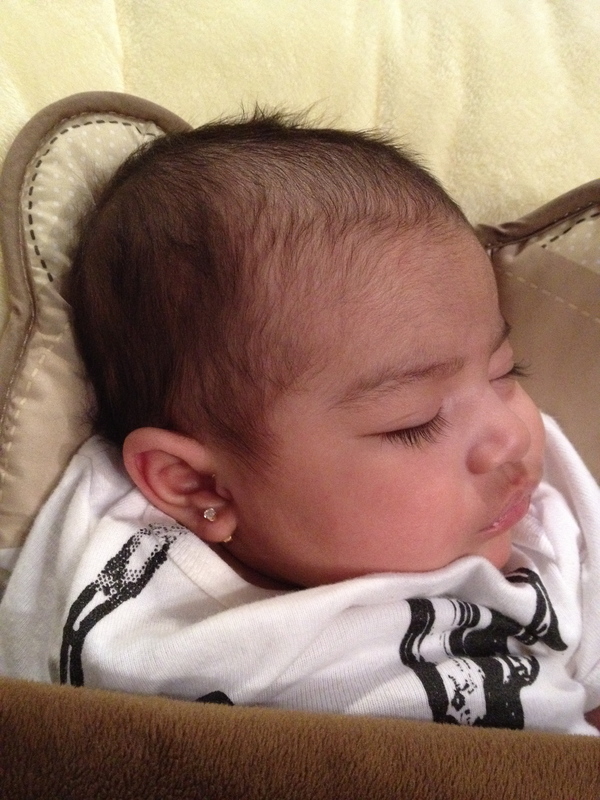 See, I took Aashi to get her ears pierced the minute she hit the two-month mark. A little anxious, but a lot excited, I was happy to be carrying on a tradition common to Robbie’s family and mine. But just as we were getting underway, a woman who was shopping with her teenage daughter came up to me and in the most condescending, critical and pointed tone, asked, “Are you really going to do that to your daughter?” (In case you are wondering, her daughter was there buying clip-ons.) Of course, I did what I set out to do that day and Aashi left with a little bit of bling in her ears. But for a moment there, this woman – who should have been minding her own business – had me questioning my decision, and by extension, my cultural norm. I had to question whether I was really being as crazy as she was insinuating. It did not take me long to realize that I was not crazy at all, in part because two-month-old Aashi handled the piercing like a pro. Aashi & her pretty ears a few hours post-piercing. But what I soon came to realize – and what Robbie’s refreshing moment of cultural camaraderie only confirms – is that piercing a baby’s ears is not at all wrong or uncommon; however, criticizing and openly casting doubt on another’s cultural norms is wrong and unfortunately not that uncommon. This point was recently affirmed by author and columnist Eleni N. Gage, whose writing explores identity, family and cultural beliefs, when she received much criticism and cultural commentary on her New York Times “Townies” article about her family’s decision to pierce her daughter’s, here. To the several lofty and narrow-minded comments admonishing her decision, she provided a terse, yet humorous and very appropriate reply at the Huffington Post, here. I love this post. When there is a confluence of your many cultures, you absolutely have to go for it! When we lived in Brazil, people refused to believe that our baby daughter was a girl, even in a pink dress, because her ears weren’t pierced. For her first birthday, neighbors gave her tiny gold cross pierced earrings, and a string bikini. I was a bit shocked, but now we treasure the story. Thank you, Susan! I agree – it is wonderful having the opportunity to honor a tradition held by both families, especially when they typically see more differences. As for the ear piercing, I think that the earrings make Aashi look especially “girly,” but at a baseball game recently, others continually referred to her as a “he” simply because she was wearing blue and orange Tigers gear – not pink. Pink/Blue, With Earrings or Without – people will see what they want to see for anything outside their comfort zone. I love reading your blog. It really helps to see your perspective of things as I’m the one who’s non-indian in a multi-cultural family. My husband has left the ear-piercing decision up to me. And while I completely respect his culture and traditions, I just couldn’t agree to have my daughter’s ears pierced so young. While I’m sure she would have been fine, it’s me that had trouble with it. I find babies with pierced ears look so much older (this is just my opinion). And for as fast as they grow in those first years, the last thing I wanted to do is have her growing up even faster. Plus, I have fond memories of getting my ears pierced when I was 8 years old. My mom took me to the mall, we picked out the studs, and she showed me how to care for them. I was so proud and it felt good that I was able to choose what I wanted. Maybe it’s selfish of me. Maybe it won’t be the same for her, but I’d like my daughter to be able to experience this the way I did. I consider it a “right of passage” and a way for her to take on responsibilities– should she choose that she wants her ears pierced. Anyways, just thought I’d share my perspective for not piercing her ears and following the cultural norm. In this suburban area outside DC, ear piercing is so common with so many families that they routinely ask at your 2 month check up at the pediatrician if you would like your child’s ears pierced…and the doctors will pierce them right there during your visit! Hi Krista! I wish it was that easy in Chicago! Our pediatrician typically does not recommend ear piercing until a child can take care of his or her own ears, but she said if we were going to do it earlier “for cultural reasons,” then the earlier, the better. Of course, she wouldn’t do it, so we ended up at Claire’s, where they were amazing, confident and so clean. And they gave us everything we needed to care for Aashi’s ears/earrings for 8-10 weeks after the piercing. Admittedly, I know a lot of people have strong feelings when to pierce a child’s ear. “Let them decide” is being replaced by parental decision when mommy intuition knows, “earlier is better” from either personal or friend’s experiences of unpleasant childhood ear piercing. I think it just depends on your own personal choice whether or not you wish your baby or little girl to have pierced ears. I think you were a smart mommy for doing it early so she can grow up with them. Initially, I was unsure, but asked our ped for her opinion about having our dd’s ears pierced. She reached in her pocket and took out a picture of her six month little girl with gold balls in each ear, saying,” …this is what I think.” She encouraged me to go ahead and said it was best as an infant when mommy could care for them. She has never had a baby with a pierced ear infection, but has had quite a few older girls ages 2-5 who said they wanted it done, but failed to care for them. She gave me some ” Care Tips for Newly Pierced Ears ” since she had so many moms ask about having their infants and little girls ears pierced. them, it always seemed they’d get infected because they were constantly touching them or trying to change out the earrings before they were supposed too. If any moms are considering it and on the fence, then don’t hesitate to write me an e-mail for our ped’s tips. I did think long and hard about what age to have Aashi’s ears pierced. For us, the timeline was either in infancy or toddlerhood, but I realized I was just looking for “practical” reasons to do it sooner than later, as an explanation for anyone who did not agree with the cultural one. 🙂 Ultimately, the best “practical” explanation for doing it so early was exactly what you stated – that infants grow accustomed to the earrings in their ears, while toddlers and younger children are more likely to fidget with their ears and have a tough time taking care of them immediately after the piercing. Thank you for your comment – it is always wonderful to get more perspectives. Safe to say he’s 2 for 2 on his predictions. Although the Millas are holding their own with the necklace and bracelet! Definitely some common ground amid the diversity. Her ears are cute with the little studs in them, but look at those eyelashes! You can tell she is a beauty already! I know I’m late to the party but I just came across this. Thanks for the kind words. I wish our blinged out babies could play together! Keep the adorable pictures coming.